Create textbook-style macros that are razor-sharp and have details never seen before. 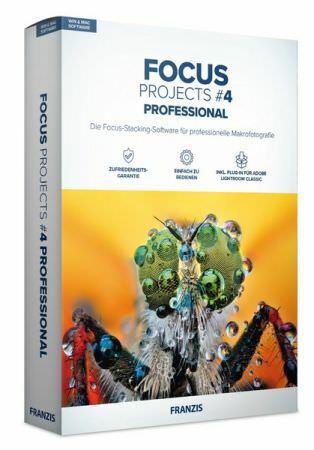 Only with FOCUS projects 4 professional‘s new technologies you can create state-of-the-art macro shots that have a fascinatingly deep depth of field and bring out extraordinary details. The Focus Stacking Software with a professional claim! Focus Stacking is the flagship discipline for macro, nature and product photographers who want to see their images in natural science forums and hip online galleries. In addition, new tools for selective image retouching, expert filters and a complete RAW developer are available. This is finally over. The solution is: Take a sharpening series – a Focus Stack! FOCUS projects 4 professional then merges all shots from 3 to 1000 levels of sharpness into a single image with unparalleled depth of field. The photographed object is now consistently sharp from front to back and all without effort and in a few seconds. You do not need to press any buttons or adjust the controls. So you get sharp macros fully automatically. With FOCUS projects 4 professional, practically as many single images can be put together in a stack as they wish. The theoretical limit is about 1000 pictures. And even those who use significantly fewer images for their stack, I am pleased about the much more precise calculation method and thus more homogeneity in his pictures. By the way: As you can see, the Focus Stacking method is also great for ultra-sharp landscape shots! The Focus Boost technologies from FOCUS projects 4 professional give your recordings another sharp boost. For this purpose, after the merging of the individual images, special image parts are used for further sharpness optimization – that is, focus stacking high.